The Ivory Tablets of the Crow is the initiatory rite of the Art of Ninzuwu, a spiritual practice said to have originated during the Jomon period, closely associated with the Tengu, Yatagarasu, and Ryujin Shinko (Dragon god faith). During the Jomon period an empire existed, whose boundaries stretched from the Far East into what is known today as ancient Mesopotamia. Traces of this empire can be found in the legends of the continent of Mu and stories about a struggle for what is known as the Tablets of Destinies, which marked the breakdown of this kingdom. The Tablets of Destinies was understood to be “the power of Anu” by the ancient Mesopotamians. 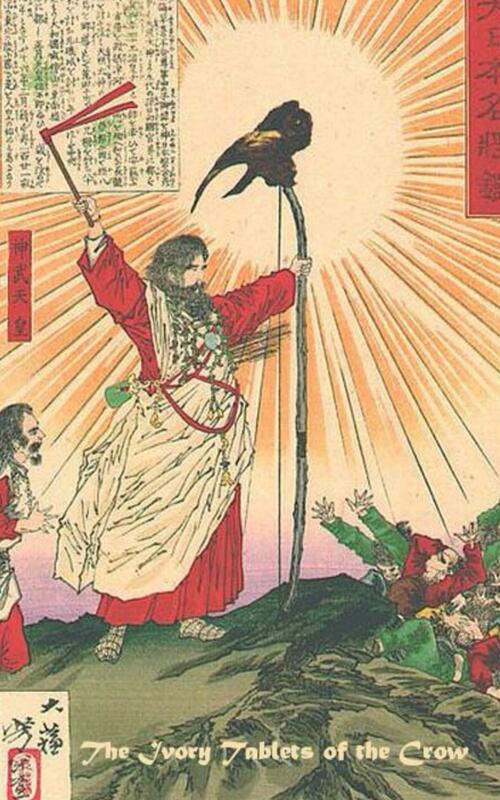 It is said by some to be the Yi Jing of Chinese, and an esoteric knowledge of a secret society that was occasionally revealed to mankind by the Tengu and the Yatagarasu. The Ninzuwu, being the keepers of the sacred knowledge, shared this technology with mankind in the mathematical language of dreams and other practices that are closely associated with what is known today as Shinto and Yi Jing Sorcery, which are not separate schools when understood properly, the Cult of Nyarzir. It was by the use of the mathematical language of dreams, that an initiate can interpret and communicate with the same forces that he/she are being influenced by, and what deity that they may call upon for clarity, but also how transmute their own DNA and evolve in being. This is the meaning of the Tablets of Destinies, also known as the Yi Jing. The Yi Jing Apocrypha of Genghis Khan is a working companion of the Ivory Tablets of the Crow and a rare translation of the I Ching (Book of Changes). Originally, it was thought to be circulated and developed by members of Black Dragon Society in their investigation of the Art of Ninzuwu (Yi Jing Sorcery).The Art of Ninzuwu is a very powerful transformaional process and is said to be one of the oldest forms of magical practice in the world. The Yi Jing Apocrypha of Genghis Khan also reveals the historical authenticity of what appears in the Ivory Tablets of the Crow and how it is applied to Yi Jing divination. The book gives a thorough, yet mystical, explanation of each of the sixty-four hexagrams and compares them to the Sixty-Four Letters of Genghis Khan. The book also explores the spiritual side of Genghis Khan and his connections to shamanism. Formulas for accessing the vibration of the hexagrams are given, as well as, advanced initiatory practices of Ninzuwu. The book also examines the Yi Jing’s relationship to ancient Sumerian spirituality and reveals the location of the legendary land of Dilmun, and the possibility of a Yi Jing originating in ancient Mesopotamia. Many people who presently use the I Ching in their lives will find this text truly rewarding. Others will now be able to validate the historical authenticity of what appears in the Ivory Tablets of the Crow. People, regardless of their political, racial, religious, and spiritual background can gain some wisdom from the Yi Jing Apocrypha of Genghis Khan. Another theme that is prominent in the text is the Yi Ching’s relationship to Shinto and the fundamental creed of the Black Dragon Society. The Appendix includes excerpts from a speech given prominent member of the Black Dragon Society and his views on Dr. Mikao Usui. Caution: The Yi Jing Apocrypha of Genghis Khan is an advanced initiatory path into a rare form of sorcery. The Hexegrams are arranged in the order of their initiatory steps. The editor suggests that the book be read first in its entirety before practice. The Nihon Shoki (日本書紀? ), sometimes translated as The Chronicles of Japan, is the second oldest book of classics in Japanese history. The book is also called the Nihongi (日本紀, lit. Japanese Chronicles?). It is more elaborate and detailed than the Kojiki, the oldest, and has proven to be an important tool for historians and archaeologists as it includes the most complete extant historical record of ancient Japan.